Wintertimeisn't the time of year most anglers think of when they want to go out and enjoya day on the water chasing bass. Especiallywhen bass are positioning themselves over vertical structural features in alake. Butwith a technique Chad LaChance uses – he calls it slinky-walking a bait –anglers can find surprisingly good success, even during the slow times of thecold months. "Inthe dead of winter, I like structure baits fished vertically," saidLaChance, a Colorado resident who hosts Fishful Thinker on World Fishing Network. 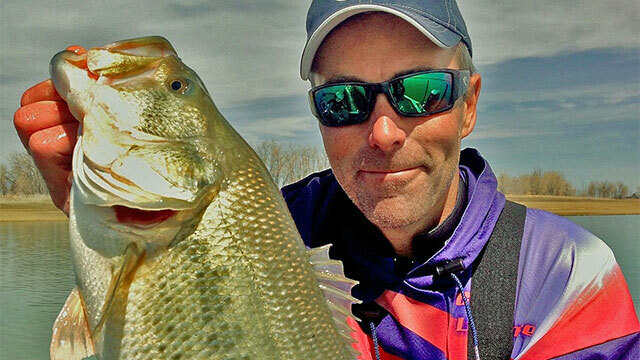 "Myfavorites are blade baits and darters – think Jiggin’ Raps and such. I (also)use the Johnson ThinFisher blade and the Johnny Darter." Whatabout colors? LaChance said he focuses on solid colors of these baits ratherthan the chrome and golden colors that he'll typically use in warmer watersituations. Howdoes the Fishful Thinker hostactually fish these baits? "Ifish them very tight to prominent main-lake structural elements like humps,outside channel swings and distinct drops into the main basin," saidLaChance. "If I’m fishing banks, it’ll be very steep and bluffy and I’llslinky-walk the bait (by) angling down the incline, just ticking (it) off therock." Asfor his tackle setup, LaChance has a few specific ideas for his slinky-walkingvertical technique. "Ifish (those baits) on TracerBraid with a fluorocarbon leader," said thepopular World Fishing Network show host. "The braid offers greatsensitivity and visibility to detect subtle bites. "SinceI prefer off-shore structure (in the wintertime), using this setup means that Ican park the boat on top of fish and fish purely vertical." LaChancealso prefers a specific rod in this situation: "I fish them on extra-fastrods for sensitivity and immediate hooksets given that bass won’t hold onto themetal baits very long." IfLaChance misses a bite, he'll often throw a change-up towards the verticallystacked fish he’s targeting. "IfI miss a fish or two, I generally follow-up with tube jig in fishy colors likesmoke, silver, white … depending on water color," he said. Ifa serious case of wintertime cabin fever has taken hold where you live, don'tsit around pining for springtime bass fishing. Instead,leave the warmth of the fireplace behind, bundle up and head for your nearestbass lake. Becausewhen you do, Chad LaChance's slinky-walking bass fishing technique is oftenjust the ticket needed to enjoy a good day of bass catching action, even whenOld Man Winter is in town.